Operation World by Jason Mandryk. Operation World is the definitive global prayer handbook that will help focus your heart and life towards God's passion for His glory. Whether you are an intercessor praying behind the scenes for world change, a missionary reaping the benefits of intercession or simply curious about the world, Operation World will give you the information necessary to be a vital part in fulfilling God's passion for the nations. 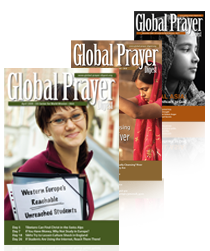 Global Prayer Digest is a unique devotional booklet that is available as a monthly booklet or as a daily e-mail. 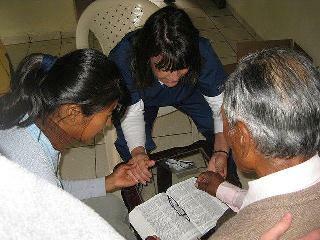 Each day it gives a glimpse of what God is doing around the world and what still remains to be done. Daily prayer for that still-unfinished task is at the heart of the Adopt-A-People movement. Condensed missionary stories, biblical challenges, urgent reports, and exciting descriptions of unreached peoples provide a digest of rich fuel for your own times of prayer for the world. by Steve Hawthorne. Ordinary believers are stepping into the streets to pray effectively for their neighbors. With eyes open to real needs and with ears open to the promptings of God's Spirit, intercession becomes an adventure. 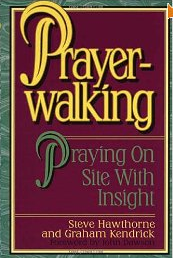 Prayerwalking gives you a practical menu of proven ideas to begin preparing whole cities for spiritual awakening. Biblical insights will build your faith to voice city-size prayers. And the stories and statements of more than one hundred prayerwalking Christians will fire your imagination for your first steps.